Heat 2 tsp oil in a pan and stir chopped garlic in it for two minutes and then the spinach. Cook till the spinach is done and add salt pepper cottage cheese and processed cheese in it and cook further for a minute. Remove from fire and keep aside. Now clean the mushrooms and trim their stems to make a cavity in the center of each mushroom. Now fill the cavity with the spinach filling and keep a thick slice from the stem of mushroom to seal it. Beat the egg and add a pinch of salt or make a slurry of maida water and a bit of salt and dip the mushroom in the egg or maida slurry and coat it with bread crumbs and deep fry in hot oil. When the mushrooms become golden brown in color drain them out on an absorbent paper and slit them into halves carefully with the help of a sharp edged knife. If the stuffing is enough then its alright otherwise place some more stuffing in the center and serve hot with a dip of your choice. Soak sabudana in water for 2 hrs. Mix potatoes, sabudana and all other ingredients except oil. Serve with dip or chuttney of your choice. Mix all the ingredients mentioned under kofta ingredient list except oil in a bowl. Make medium sized balls and fry the koftas in hot oil till golden. Clean ,wash and chop spinach. Take spinach,onion,tomato,green chili,ginger and garlic a pan and cook for 5-7 minutes till all the ingredients are cooked. Now puree the spinach along with other ingredients with the help of a blender. In another pan heat one tbsp of butter and add cumin seeds and when it turns brown in color add tomato puree and all the spices and salt one by one. Cook for five minutes and mix the tempering with the cooked spinach and mix well. Add the Paalak gravy first in the serving plate or bowl and then place the koftas now pour a bit of gravy over the koftas. 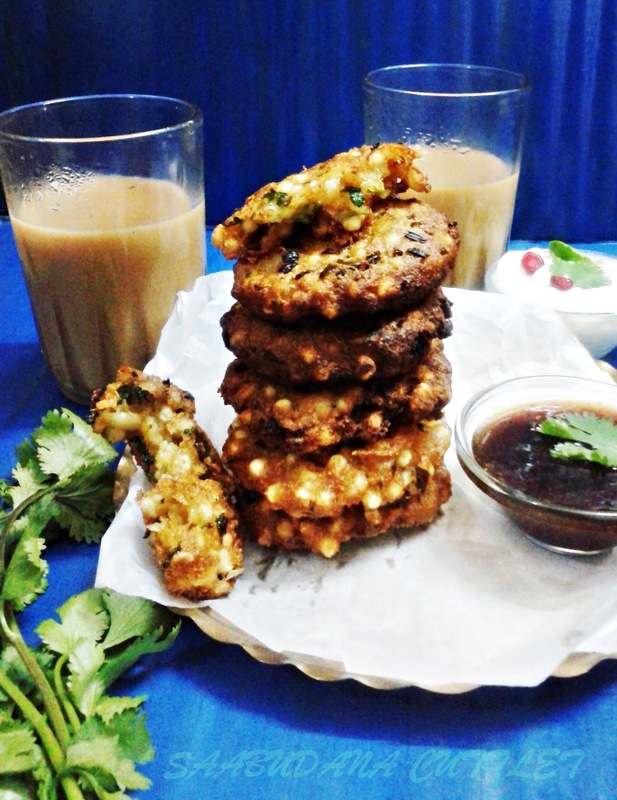 Serve Paalak kofta hot with rotis or naan. 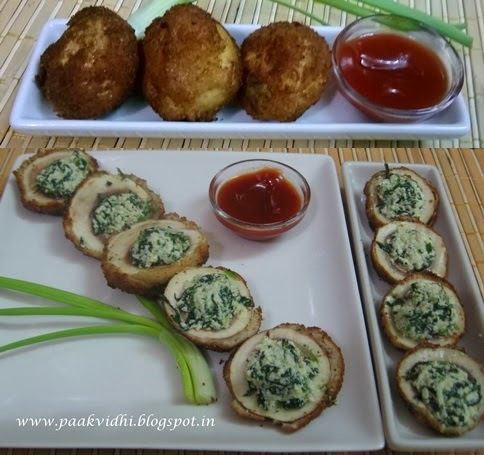 Garnish the Paalak kofta with some cream or grated paneer. Mix all the ingredients and very little water if required and knead the dough. If the dough is sticky add some more flour.Now put a little oil on your hand and pat your hand on the dough and kneed it again and keep it on rest for five minutes. Take a small polythene sheet or a clean polythene bag and place it on the rolling board(chakla). Dust it with some chestnut flour or grease it with a little oil or sprinkle a few drops of water on the polythene sheet. Take small or medium sized balls from the dough and spread the balls with wet hand on the polythene sheet. Now pick up the polythene sheet and carefully remove the roti from it. Place it on hot non stick tava(griddle) and cook the roti from both the sides while pressing with the help of a spatula. You can apply oil on both the sides and cook it like parantha or deep fry it in hot oil like poori. 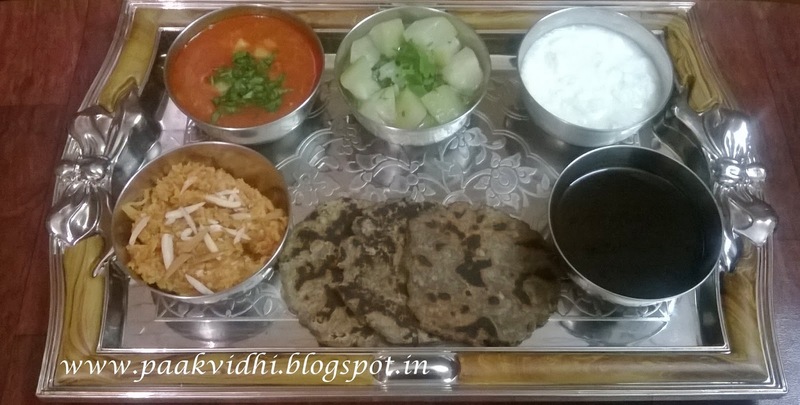 Serve the roti hot with vrat ke aloo, ghiya (bottle gourd) sabzi curd,tamarind chuttney and gajar ka halwa etc. Soak chick peas for at least 2-3 hours or overnight, drain out excess water and boil chick peas along with water,tea bag,dry amla and salt in a pressure cooker. Simmer the gas after two whistles and cook for half an hour. Now switch off the gas and when the pressure releases remove tea bag and the amlas and check whether the chick peas are done, if required,cook for some more time under pressure. If there is more water than required then cook the chickpeas without lid till you reach the desired consistency mean while mash the chick peas with light hand so that some of the chick peas are mashed but not all to make a thick gravy. Now switch off the gas and spread onions,tomatoes,green chilies and all the spices except cumin seeds and asafoetida over the chick peas and make a layer over them in the cooker itself. Now heat oil in a pan and add cumin seeds and asafoetida , when they change color pour the hot tempering over the chick peas and close the lid without switching on the flame for ten minutes. This way all the smoke of the tempering will release its aroma in the chick peas. Now mix the tempering with chick peas and at the time of serving mix the lemon juice and coriander leaves. Serve hot with kulchas readily available in market but cook them from both the sides on a tava or hot griddle while applying some oil or butter on both the sides.If the kulchas are too thick then slit them into halves and then cook. You can also make kulchas at home through the recipe that follows. Take flour and add baking powder, soda bi-carbonate and salt. Mix well and pass it through a sieve. Mix yogurt and powdered sugar. Add this to the flour and add water as per need and mix gradually to make a soft dough by light kneading. Incorporate 2 tbsp oil into the dough and cover the dough with a wet cloth. Keep it aside for an hour. Roll the dough into balls of same size and keep them a side for 5-10 minutes for fermentation. Now grease the balls with a little oil and roll them to make round not very thin kulchas. Heat a tava or griddle and cook the kuchas applying oil on both the sides and cook till light brown spots are visible on both the sides. 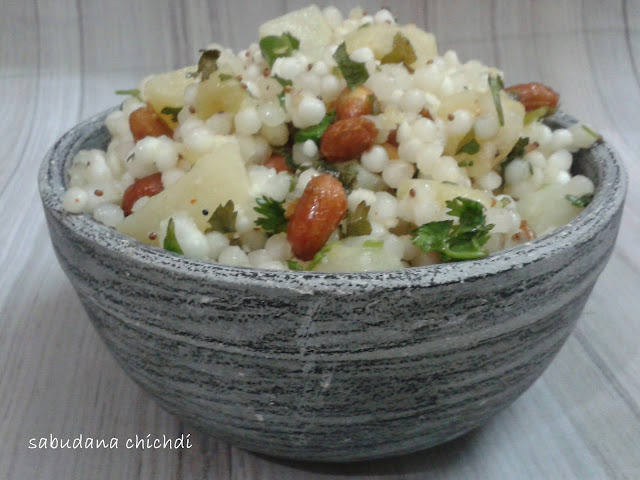 Put poha in a soup strainer and run clean water over it so that all the poha becomes wet toss it and check that all the poha is wet and if required sprinkle some more water on the poha which is still dry. Let it be in the soup strainer and keep the strainer over a vessel so that if there is any excess water that is drained out. Heat oil in a pan and add mustard seeds ,curry leaves,green chilies,ginger and peanuts in it. When peanuts become brown in color add onions and then put all the vegetables in order of there tenderness and stir fry for 2 minutes or till they become crunchy.If required add some water and coot the vegetables under lid. Now add all the spices including turmeric powder, then add salt, pepper and poha and mix well. Cook for two minutes and add sugar and lemon juice. Garnish with coriander leaves and serve hot with ketchup,chuttney or sambhar. Wash sabudana and then soak it in one-cup water for three to four hours.Meanwhile keep stirring the same after regular intervals. It should become fully moist. Heat ghee in a pan,add asafoetida powder,curry leaves, cumin seeds ,grated ginger and chopped green chillies. When cumin seeds crackle add peanuts and stir them in ghee for 2-3 minutes. Now add the potato cubes. Cook till the potatoes are done. Add sabudana and scraped coconut, black pepper and garam masala ,saute for four to five minutes, stirring well. Add 2-3 tbsp water add salt and lime juice and mix well. Remove from heat. Sprinkle chopped coriander leaves and serve hot along with tamarind chuttney or curd. You can add vegetables of your choice like carrot, peas,cauliflower,capsicum etc.along with potatoes and you can add cheese as well.But put the cheese at the end. Take one tbsp butter in a pan and saute corn kernels in it till they become soft and take them out in a bowl. Take spinach,onion,tomato,green chili,ginger and garlic in the same pan and cook for 5-7 minutes till all the ingredients are cooked. Now add corn kernels and fresh cream and corn palak is ready to be served with chapati. Divide the milk in 3 parts and boil 2/3 rd milk in a pan. Dissolve cornflour in the rest of 1/3 rd cold milk and pour the mixture in the boiling milk stirring continuously. Cook for 3-5 minutes till you reach a thick consistency. Switch off the gas and keep it a side for an hour.Now refrigerate it atleast for an hour. Now when the custard becomes completely cold beat it with the help of a blender. Now divide the custard in five portions and add red, green yellow syrups in 3 different portions. Add coco powder and powdered sugar to taste to make brown custard in 4th portion. Add cardamom flavor or vanilla flavour and sugar to taste in the fifth portion. Take glasses and place crumbled biscuits or cake and then five layers of custard one by one and garnish with chopped fruits or jelly. You can make any type of custard using ready made flavored custards available in the market. 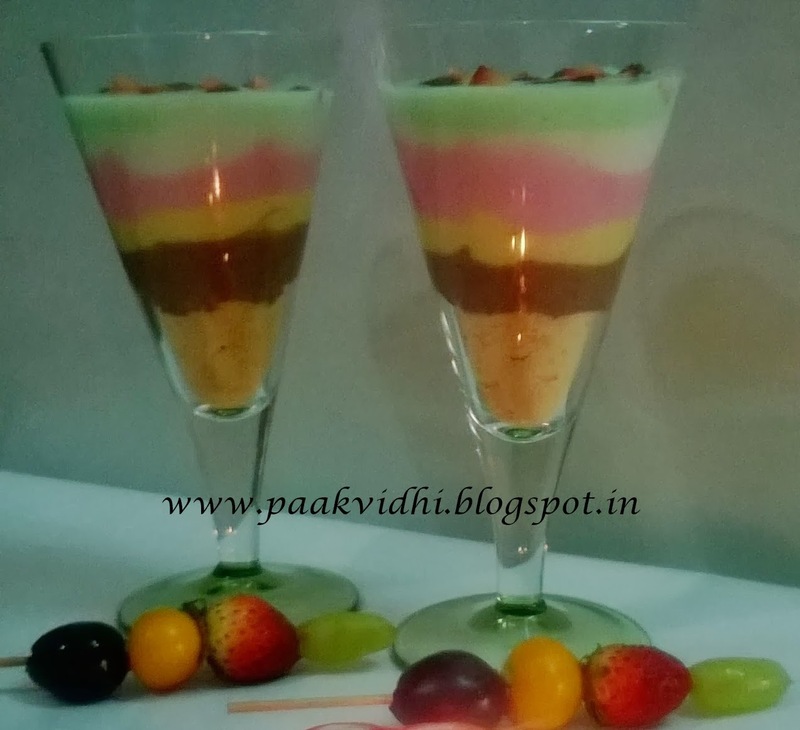 You can add chopped fruits in different layers of custard. Combine the biscuit powder, sugar powder, fruit salt and sieve 2 times. Transfer in a bowl, add vanilla essence and slowly add 150 ml milk and 1 tbsp of oil to the sieved mixture while whisking continuously. Add more milk if required to form a batter of pouring consistency. Pour into a greased and dusted microwave safe bowl and microwave on high for 4-5 minutes. Cool and unmould and cut to pieces and serve. Coarsely chop onions,ginger and garlic in a chopper or in a food processor using chopping or grater blade or grate them along with ginger and garlic with the help of a grater. Heat oil in a pan, add cumin seeds and allow them to crackle. 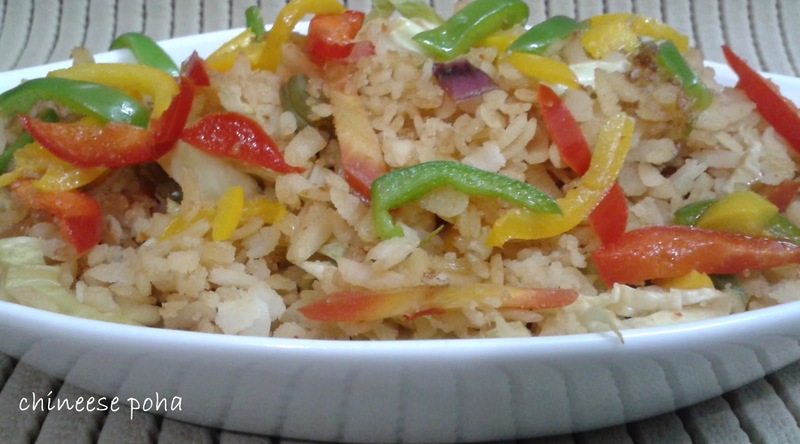 Add finely chopped or grated onions,ginger and garlic paste and saute till it turns light golden brown in color. 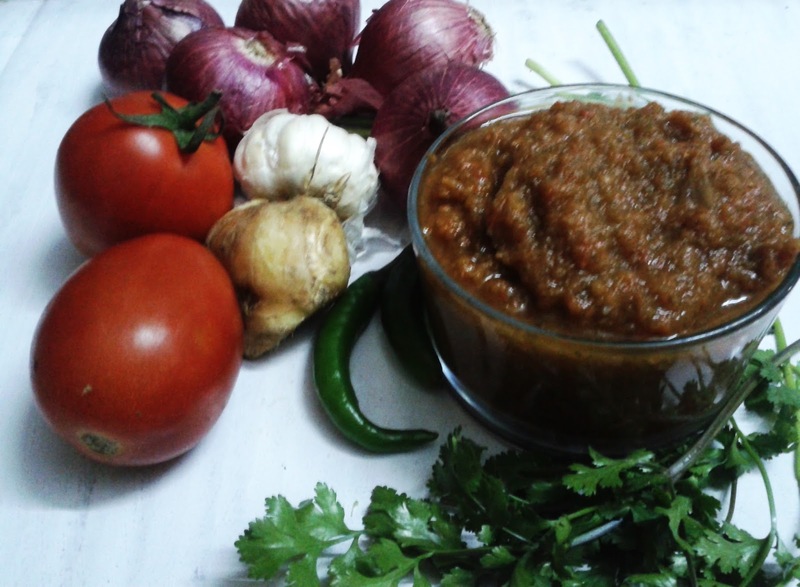 Puree tomatoes,green chilies and coriander in a mixer or food processor. Add this puree in the onion mixture and cook till all the water in masala evaporates and it starts leaving oil. When it completely cools down then store it in a steel or glass container in fridge.You can keep it in fridge for almost a week. If you want to store it for more days then store it in a deep freezer. Bhuna masala or basic curry masala can be used in various curries, vegetables and non vegetarian dishes. This much masala is sufficient for a family of four for a week to cook 12-15 vegetables or curries. Heat milk in a pan when it start boiling add oats. Stir continuously and cook for 2-3 minutes or till you reach the desired consistency. Add sugar and chopped almonds. When it becomes a bit cold add chopped strawberries. 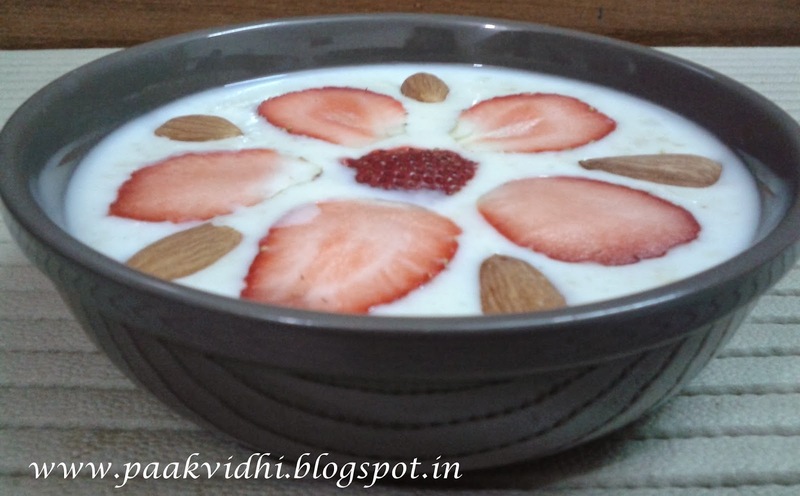 Serve garnishing with slices of strawberries and almonds. Heat oil in a pan and put all the vegetables in order of there tenderness and stir fry for 2 minutes or till they become crunchy. Now add soya sauce,chili sauce and vinegar, then add salt, pepper and poha and mix well. Heat oil in a pan and add finely chopped garlic. Add the mushrooms and then add salt and black pepper. Cook it for a while. Add mixed dry herbs and add it to the pan. Keep it aside for cooling. For the ravioli, knead the dough by mixing all the ingredients of the dough and make a tight dough. Roll out the dough by dusting with flour. Roll the dough to make fine thin sheets or chapaties. Then cut the sheet into small circular shapes or discs. Use water to stick the discs on the sides. Then fill the discs with the stuffing. Cover the disc with another one. Put markings in the outer ring of the circular discs with the help of a fork. Now, put this in boiling water for 15 seconds, then remove and put in cold water. Heat olive oil in a large saucepan, and saute onion and garlic until tender. Mix in broccoli, and vegetable stock. Bring to a boil, reduce heat, and simmer 15 minutes, until broccoli is tender. With a hand mixer or in a blender, puree the mixture until smooth. Return to the saucepan, and reheat. Mix grated cheese and fresh cream and season with nutmeg, salt, and pepper. Dish out the sauce onto a plate. Now remove the ravioli from the cold water and place it in the plate with sauce. 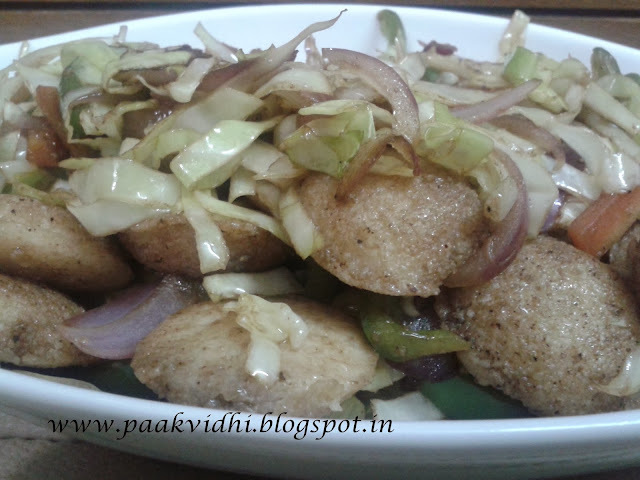 Make idlis either instant rava idli or rice idli. 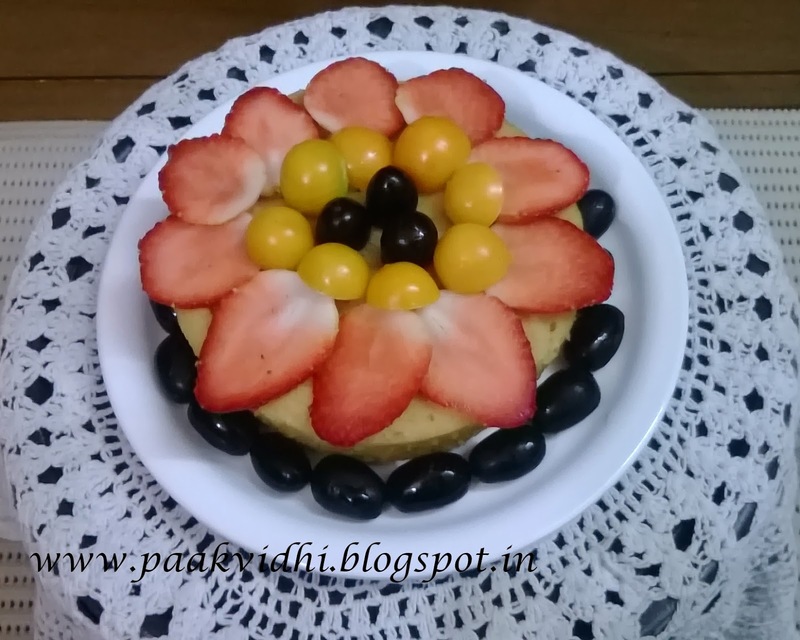 If you have a big idli mould then make big idlies and then cut them into two or four pieces. Heat oil in a pan and add onions,carrots and capsicum to it, when the onions turn pink in color add salt,pepper,soya sauce,schezwan sauce and vinegar to it and mix well. Now add prepared idlies and cabbage and mix well. Chinese idlis are ready to be served. You can make idlis using a plain idli ready mix available in the market. Peel ginger and clean it with a dry cloth or kitchen towel. Chop ginger in thin long slices. Chop green chilies as well lengthwise in four pieces. Take both the things together in a bowl and mix rest of the ingredients. Shake well and keep it in a warm place for a day, it will be ready to eat. Store this in a container preferably in fridge. Clean green chili with a kitchen towel and remove the stem. Now cut green chilies into 4 pieces lengthwise or in any shape of your choice. Coarsely grind mustard seeds in a mixer and mix salt and turmeric powder in it. Now put all the ingredients except lemon juice in a jar and mix well by shaking it. Now add lemon juice and shake well once again. Keep it in sun for a day or two and when it becomes a bit soft and become tangy, it is ready to be served. It is recommended not to wash the chilies until they are dirty,just clean them with the help of a dry kitchen towel. 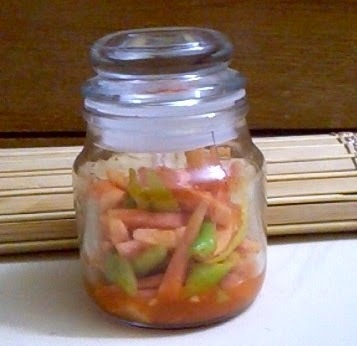 It will last for more time if you keep it in fridge in a covered container.